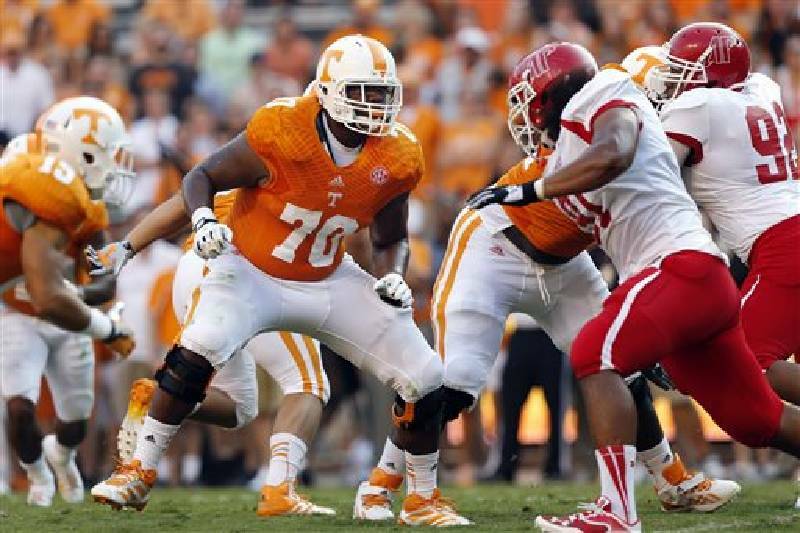 Tennessee right tackle Ja'Wuan James (70) blocks during the Volunteers' win over Austin Peay last season in Knoxville. James was selected in the first round, 19th overall, by the Miami Dolphins in the NFL draft Thursday. KNOXVILLE - The decision paid off. A three-year starter with NFL potential, Ja'Wuan James could have chosen to jump early to the NFL draft or play his final season at Tennessee under his third coaching staff. The offensive lineman chose to play his senior season with the Volunteers, a decision he's said many times since was the best one he could have made. That notion was confirmed Thursday night. The Miami Dolphins selected James with the 19th pick of the draft. "It definitely helped, by staying and coming back," James said following Tennessee's pro day in April. "I just went out there and tried to compete and tried to the best I could for myself and for Tennessee. All my resume is on the film: They'll look at it and take it as they see it." The former four-star recruit from the Atlanta area came to Tennessee under Lane Kiffin as a January enrollee for the 2010 class and started all 49 games of his career at right tackle the past four seasons. Though it long appeared Antonio "Tiny" Richardson would be the first player taken off the Vols' veteran offensive line, James improved his stock with an All-SEC senior season after deciding to stay and play for first-year Tennessee coach Butch Jones and impressive performances during the draft process. Following Tennessee's pro day, James had meetings with 13 teams. "[Tennessee] may have four offensive linemen drafted. I thought he was their best player," NFL Network analyst Mike Mayock said after Miami selected James. "The more tape I watched of this kid, the more I liked him. "He started out in a lot of people's minds as a third- or fourth-round pick, became a solid second-round consideration, and obviously Miami likes him better than [Alabama's Cyrus Kouandjio] or [UCLA's Xavier Su'a-Filo]. When you line him up in Miami, he can play right tackle, and I think they have a big need there. He could play right guard. "Either way, day one, he's going to be a starter, and they've got to rebuild that entire offensive line." The 6-foot-6, 311-pound James is the 45th first-round pick in Tennessee's history, and the Vols have had a player taken in the first round in every year except two (2011 and 2012) since 2005. They have had nine first-round picks in the past nine years. James is the Vols' first first-round lineman since Charles McRae and Antone Davis went seventh and eighth in 1991. In Miami, James will be reunited with former Tennessee teammate Dallas Thomas, the Dolphins' third-round pick (77th overall) in the 2013 draft. With the Vols, James was a dependable player and a favorite of his teammates, and he was always first class off the field. "Ja'Wuan James brings so much value to a National Football League team, in terms of he can play multiple positions," Jones said before Tuesday night's Big Orange Caravan stop in Franklin. "He can play guard. He can play tackle. He's extremely athletic. He's bright. He's intelligent. He's tough. "It does not surprise me all the attention that he's garnering right now, and you know what, he's deserved that. He's put himself in position to deserve everything that he gets."